There's something strange in the neighborhood! Click here to play! Ghosts are haunting the neighborhood, causing everyone a lot of trouble. You'll need to hunt them down and capture them in order to save the day and win, win, win! Keep your eyes peeled for the BOO! Symbol. This scary shriek is very valuable, as it will lead you to the wins. Spin three of these across any of the five pay lines and you'll win top prizes. In fact, line one will get you 1000 coins, line two will get you 2000 coins, line three will get you 3000 coins, line four will get you 4000 coins, and line five will get you a massive 6000 coins! You'll also want to spin your fellow ghost hunter across the reels. This helpful little guy will get you up to 300 coins! There are also ghosts and BARS to help you bring in the wins! 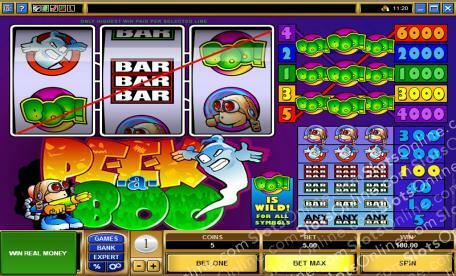 Bet the maximum of five coins to activate all five pay lines. This way, you'll be sure to bring in all the wins! Become a ghost hunter in this 3 reel game and you could walk away with plenty of cold, hard cash! The BOO! Symbol is wild. It will replace all other symbols to help you bring in more winning combinations.